We often have used sweepers available. The inventory varies as they come and they go. What you see below are the machines we currently have available and ready to go. However, there are typically some machines in process and, after so many years in the sweeping business, we have numerous connections throughout the industry. If you don't see what you're after, just let us know what you're looking for and, chances are, we can find the right machine for you. This 347-I has been refurbished and is in excellent condition. Chassis features include A/C, radio, power widows, door locks, and a nice interior. Has been driven 135,000 miles. 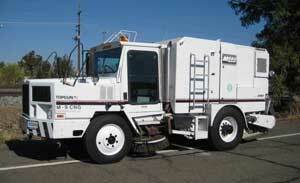 The sweeper has a shroud, curb broom, dust suppression and lights. On sale now for just $32,000. Give us a call for complete info and more photos. This Top Gun offers classic broom sweeping with the added advantage of being a CNG unit. This is an ex-city machine that is in very good condition. Won't last long at $27,000. Give us a call for complete info and more photos. Diesel-powered, with a 5.9 Cummins engine. This is an ex-city unit that was well mantained. A good value at $25,000. Give us a call for complete info and more photos. REMEMBER: If you don't see what you're after, just let us know what you're looking for. Chances are, we can find the right machine for you.